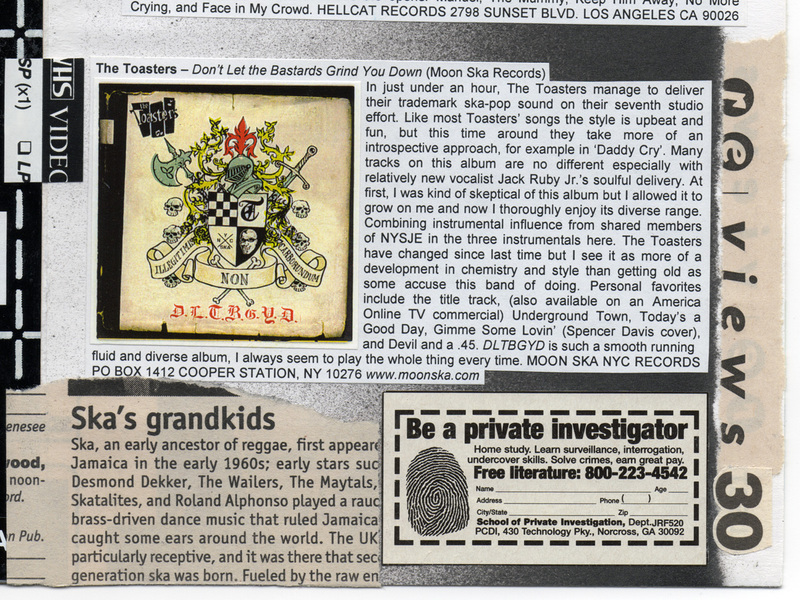 made debut at Toasters' show in sixth month June 16, 1999 with more hard to get interviews. Same day Ivy Astra turned 24, and Jah Crunchy 40. 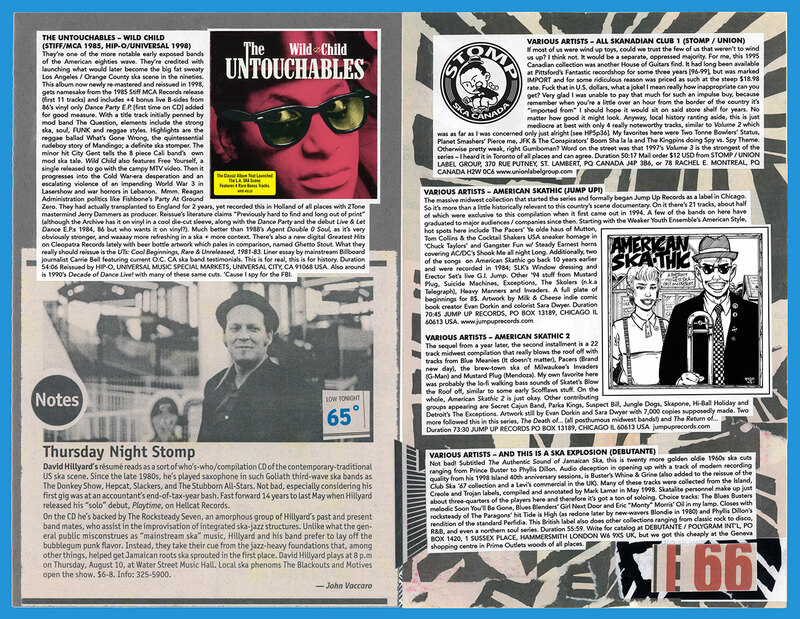 Delivering bigger names from three waves four decades of ska music in 64 pages + a vinyl sticker, you can't get that anywhere else. Praised by many a band and fan. Cover here was serious then took a lighter tone with the second run. Kress was now at Oswego finishing his degree so interviewed Pilfers & Spring Heeled Jack w/ help from Alex Wegner & John Huber. Mearns was refueling big ol' jet airliners and delivered some Blackouts Geneseo, Scofflaws Fredonia, Pilfers Cortland photos. Over a year since the last, it turned out better than expected and was worth the time, featuring 60+ music/ 40 print reviews. 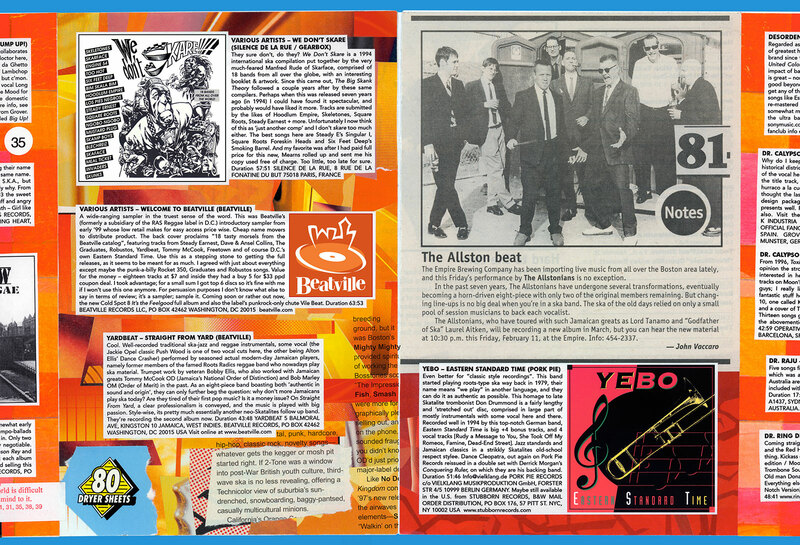 An incomplete Mark Foggo discog plus little articles about 80s NY/ Boston compilations. 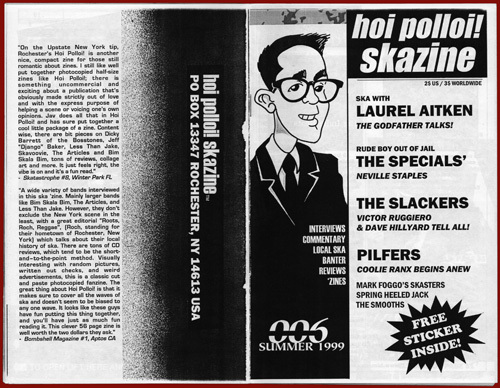 Lost interviews w/ Reel Big Fish by Thom Nicolette and Rancid's Brett Reed (Buffalo NY) unfortunately never made the cut or the following issue. Music is about keeping records, without attention to detail we are nothing. On 4/9 Matt Austin turns 20 and Pietasters 'Bitter' is in Never Been Kissed starring Drew Barrymore. This site was compiled late 28 APR 99 as last minute senior final for an independent study on history & new media. Its basic HTML was updated once mid-January 2000, in mid-January 2002 things were added, a bunch of scan retouch done for galleries. Since then, it's been up & down and probably won't be changed too often. Maybe as a home for archived content when needed? Timeline reconstructed mostly from memory but had to consult the paper trail a few times. 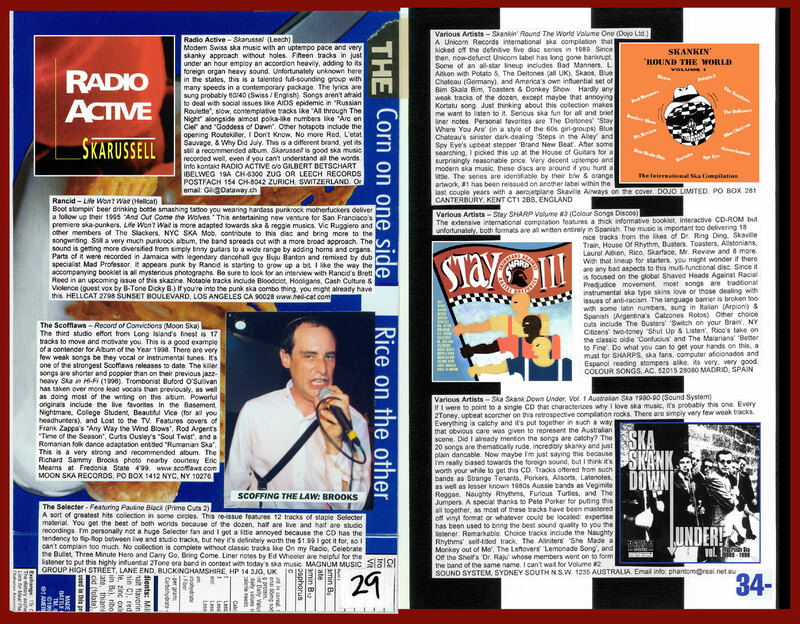 Reading and writing liner notes in detail, shout it from the Windows 98. I hadn't seen either Dan or Denis in over a year 'til that surreal 21+ and not-ska-crowd Bug Jar show. Delivered uncle Buck a copy and he mentioned funny sad but true last laughs about the Abby clash of HP#3, plus a large embezzelment scandal just broke at the world's top ska label  but this man's got 99 lives. All among drunken ramblings about marketing satin flight jackets! 5 years + 1 day after our 'zine was named, midwestern favorites Johnny Socko played Mishawaka, IN at a diy space called Hoi Polloi (missed it) 6/18/99. Venue closed soon after & Carla sent us a shirt. Wood$tock burns as Napster starts up, establishing itself the largest tape-trading community in history. 006 was final HP assembled at the old 14534 apartment and since we moved again, its phantom address changed [to Professionals' box] likely for the last time. Now it's 1-3-3-4-7 almost every day. 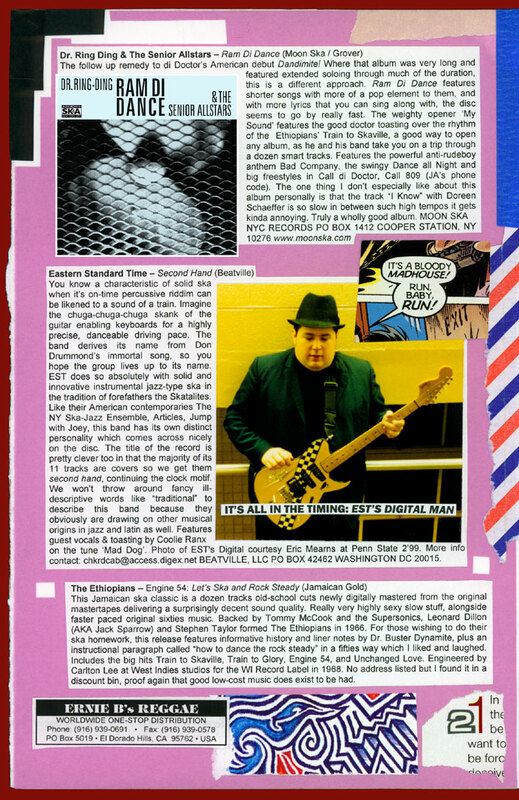 Back in city limits, Fritz's ska TV show is in gear and with it the help of a weekly mention. We get about 95% crank calls or people who want nineties dancehall  "I'd love a Babycham" she exclaimed. Matt Katz phones up almost every episode and when in London, he went to Gaz's Rockin' Blues & used Mayall's mobile to call mom & dad back at the hotel! Respect to Jeff from R.U.S.H. (our local skinhead firm '89), and Incosi for keeping it copasetic. Skank on This TV organized 9 local fans to pool funds together for a roadtrip from R.I.T. campus to 3rd annual (and final) Penn State ska fest in an Econoline  Tiffany Transport won't rent to students  February event is sponsored by Jeremy Meyers' Freefall ska zine/ Jumpstart Records. Next came the organization of a Flour City showcase of 16 April compiled an all-local lineup at Token Joe's (Fat Tsao, Motives, Blackouts & 5 Head) with the help of swanky Chris Seaver. Years earlier this had been the landmark Scorgies; nearby soil The Specials played on during their only U.S. tour February 1980! I went to the Hoi Polloi website. That's some success you've had. 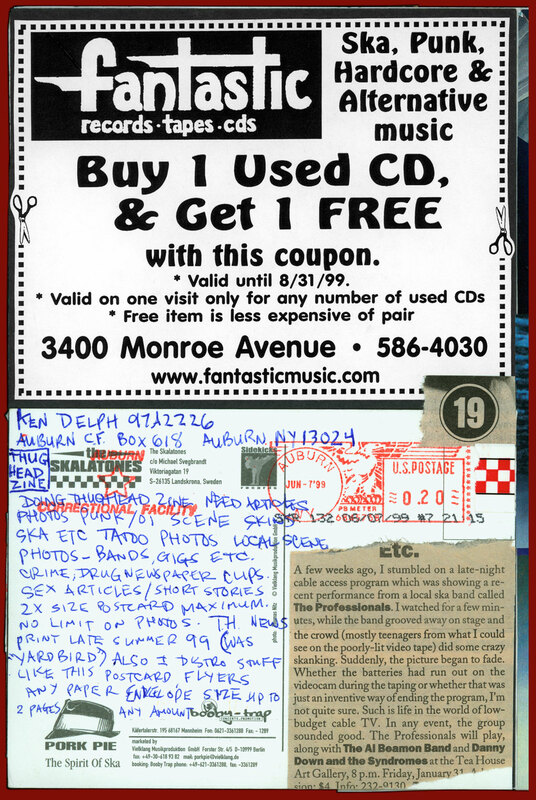 Mere days before issue 006 got duplicated, we received a Skalatones postcard from Ken of Thug Head 'zine and Auburn Correctional Facility, and wonder if he knew their claim to fame is the track "Mr. Probation Officer"? We later learn the warden won't let you read contraband stuff like HP in the clink, so he never saw a finished 'zine  yet managed to get enclosed girlie pics? You figure it out. Another issue again to wreak havoc on local radio with more scathing FM quality control vitriol courtesy Mr Fritz. R.I.P. 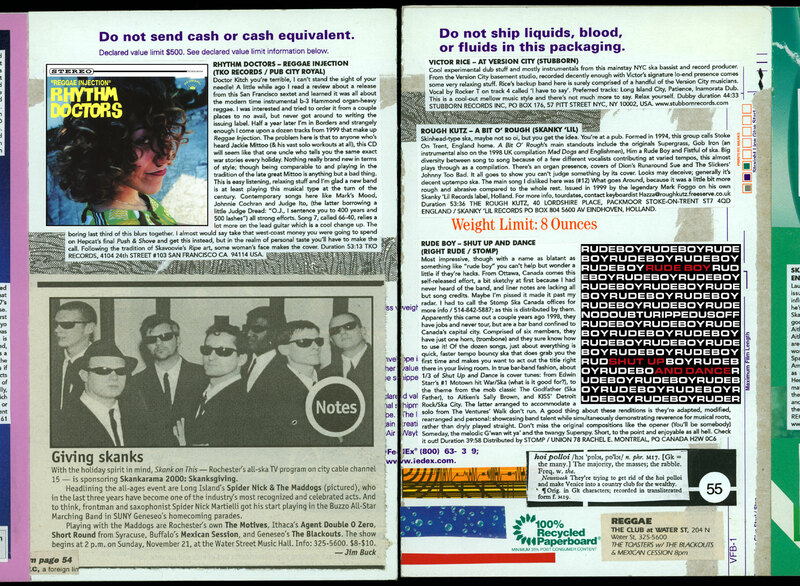 Skatastrophe The national all-ska magazine based in Florida expires after eight massive & impressive issues. Like HP, it began Fall '95 as an outgrowth of editor/ publisher Jamie Bogner's work as a Rhodes College dj. Don't argue. Some area bands featured here broke up after this came out, but some didn't like the Motives and Geneseo's Blackouts. Aquinas evermore! 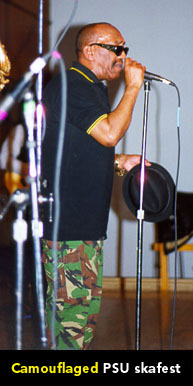 Oct 19 the TV crew guest host Shannon Dunham's WITR Ska On My Radio show with 2 hours exclusively upstate ska. On this date he pulls out the lost HP2 addressed to Lil' Davey, shoved behind a metal filing cabinet three years and tragically never made it to him. Magazine has a few creases but is in good condition  no tears, been kept flat for years. Pietasters Syracuse that September. Nov 21 ska tv hosts what would become its first annual Skanksgiving fest at Water St with Spider Nick & Maddogs + 5 upstate acts. A pipe burst and our apartment got soaked. 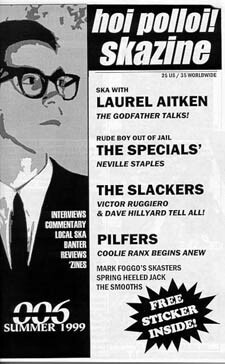 Fast forward a year and headliner is the Slackers w/o Vic! Maude Flanders killed by flying tshirt 2-13-00: "I'm really sorry to hear that. We just lost our drummer to a Pentecostal ska band. Uh, I know it's not the same but." Considering Mexican Cession Jurassic Park & Douglas Leader's DLO NAVY parody tees, PLAYSKA® logos get screenprinted as promotion for cable access. wayne's world party time excellent. I get a real job, meet Marty K, we go to lunch at the honky tonk rib joint where he encourages me to check out a cool dino band mural painted over the stage  to which I can volunteer superb CNY illustrator Elliot Mattice is artist. Allstonians! Pressure Cooker hits Empire Brewing Co. twice in as many months. Execution on the third of May, Metallica & Dr. Dre bring litigation against Napster 5/3. Rudy Boesch, (Survivor) born in Rochester gets his own "Rudy" action figure. 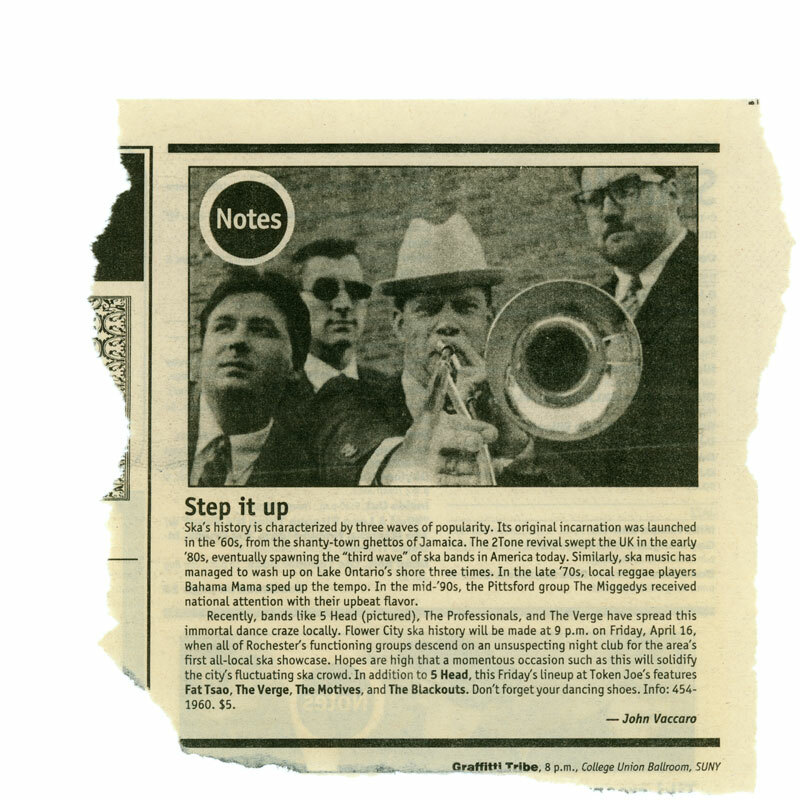 Thursday Night Stomp 8/10/00. 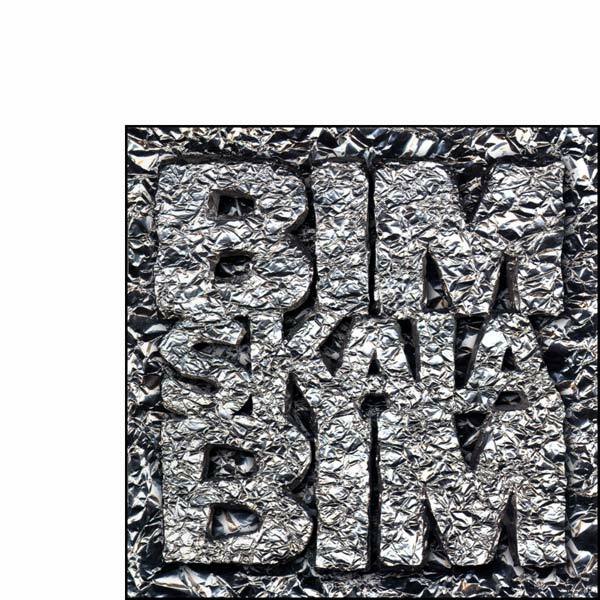 C'mon Mr. Krinkle tell me why Beantown veterans Bim Skala Bim do a muni mula foil cover concept for their 8th album, 9/23/00's Krinkle, inna similar reprographic style to HP1 face. Randomly came across Rude Tales comics wherein a shady bicycle-pedalling Noah W. chronicles his side of a run-in with sister JoAnn at SUNY Albany years prior  she handed him a flyer for #5, so he mentions it in print. An especially long winded ska timeline written for her ethnomusicology class soon gets turned into a trifold brochure. A domestic first-class stamp costs 34 cents, but we all knew not for long. 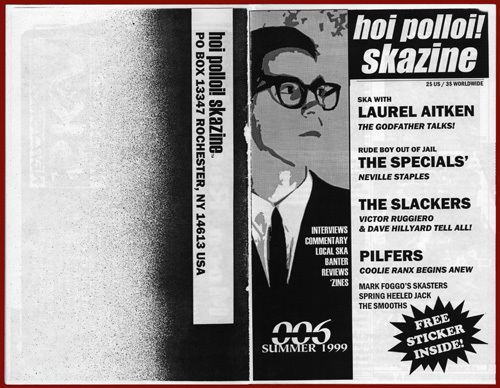 Retail distro of ska music changed drastically but a few copies of the mag were carried in stores in Rochester, Syracuse, Buffalo, NYC, Montreal, Lund (Sweden) and Eindhoven (Holland) for ska die hards. 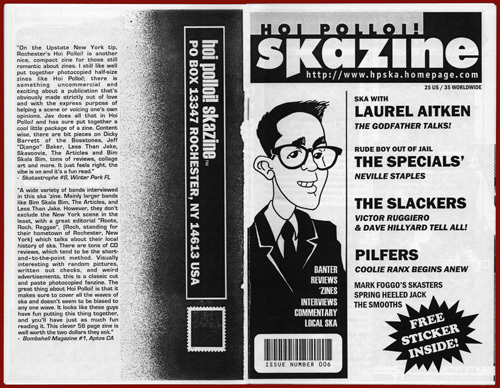 You could ask for copies at Olivers Syracuse/ Sound Garden Geneseo/ Bop Shop, Fantastic, Ultrasonic Rochester and Home of the Hits Buffalo; sold on a consignment basis. Compared to a larger run like 40,000 there weren't that many made. I know i've got my number six somewhere and I've had my sticker on my sax case for years  now it's been moved to my car "dance, music, printed, SKA" amazing! So you see, its kind of hard to teach someone punk rock at 23 years old. Either youve already learned it, or youre not about it. 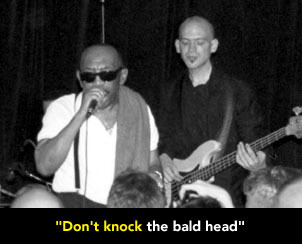 If you played in funk bands, jazz bands or fusion bands while the punk thing was going on, you missed it. 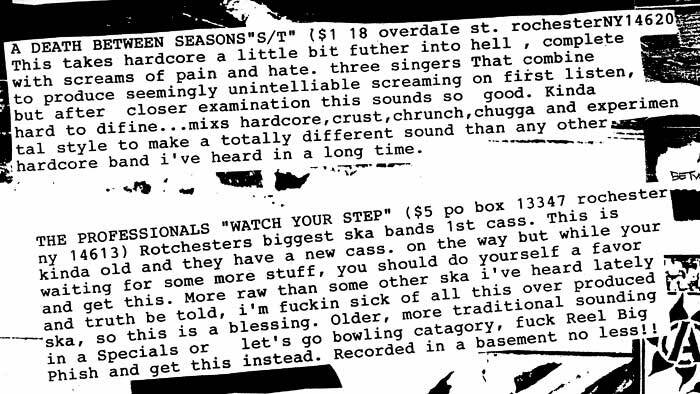 Know what I mean, its not like well now Im going to teach you how to be a little sloppy at this spot, and so youll never have a band that sounds like The Specials, because they were a punk band that played ska. Dinkus Nine (Buffalo) NUMBER CRUNCH: 16 leaves = 64 pages half-size. Initial press run 200. Since we got a better income shortly after finishing this paste up, made up 2 additional sets of 100 and the masthead changed. Met a punkrock Staples copy clerk Jen S. who really liked Pilfers, but was unable to find their CD anywhere. Upon quality-assured pickup we left her to keep track of our $5 used Chawalaleng. Better her than us, never really liked 'em anyway. 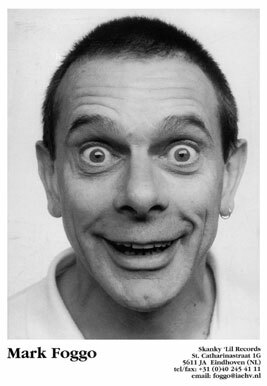 As much as they ran in the opposite direction those guys could never really escape the ska scene; it was their destiny. In the midnight hour, I say the best thing is listening to old Wilson Pickett tapes and mentally having Coolie's chat fill in the gaps. Made more there before they went all super ethical copy law enforcers. Wazmo Nariz forced to go Kinkos where you must understandably sign off with photo ID, they keep it for a lawyer as release from liability with overhead much higher. There were quantities of this variant around long afterward, but they're mostly gone now. 10 JUL 99  J.P. Indelicato proclaims HP! a cult collectable for years to come. Polyethylene bags & stuff.